There’s a very good reason why river cruising is one the fastest growing types of travel! You get all the pleasures of an ocean cruise - being afloat, unpacking once, excellent accommodation and dining, constantly changing scenery - but without some of the disadvantages an ocean cruise may have - seasickness, limited time ashore, the feeling you’re just dipping in and out of the ports of call: none of that applies to a river cruise. 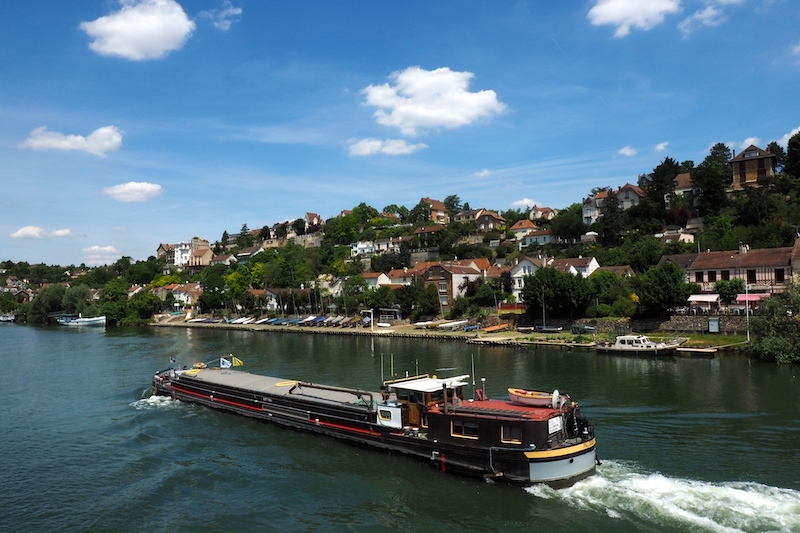 Following the Seine for 8 days from Paris to Normandy and back again aboard the Avalon Waterways’ Tapestry II personifies the best about gliding along a river. There’s the ship itself, for a start. Launched in 2015, it’s full of luxurious comforts enjoyed by just 128 passengers in all-suite accommodation. The biggest on the water, the Panorama suites, are unique as the beds face wall-to-wall windows, allowing for the most beautifully lazy sightseeing ever. Behind is a spacious marble bathroom where L’Occitane toiletries are especially fitting for this super-French cruise. 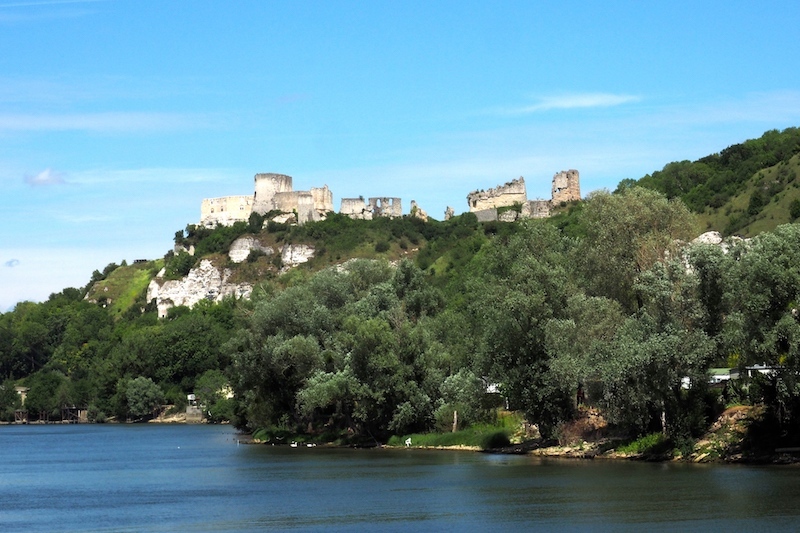 Castle along the Seine: The rivers sights are a feast for all of your senses (photo: Pamela Wade). Naturally, the dining is equally influenced by the location. With three options for breakfast, three courses for lunch, afternoon tea, chef’s special dinners with five or more courses and supper, there’s ample opportunity to indulge in haute cuisine. There’s nothing refined about the wine pour though, as the waiters cheerfully fill your glass to the brim. “We have so much of it!” they cry. Happily, the dinner wines - regional specialties like the food - are complimentary. So too is the WiFi, which is handy for getting a head-start on your bragging; but even the greatest social media obsessive will find it hard to keep focused on their screen. That’s because of the river cruise’s very best feature: there’s always something to look at. Much of it will be looking back at you, like the laid-back cattle knee-deep at the river’s edge, the friendly fishermen and dog-walkers along the bank, or the birds singing in the trees as you glide quietly underneath them. The only disadvantage to those recliners up on the sun deck is that they don’t rotate, which means you can’t spin them round to check that you’re not missing something behind you because, surely, you will be. Then there are the excursions. 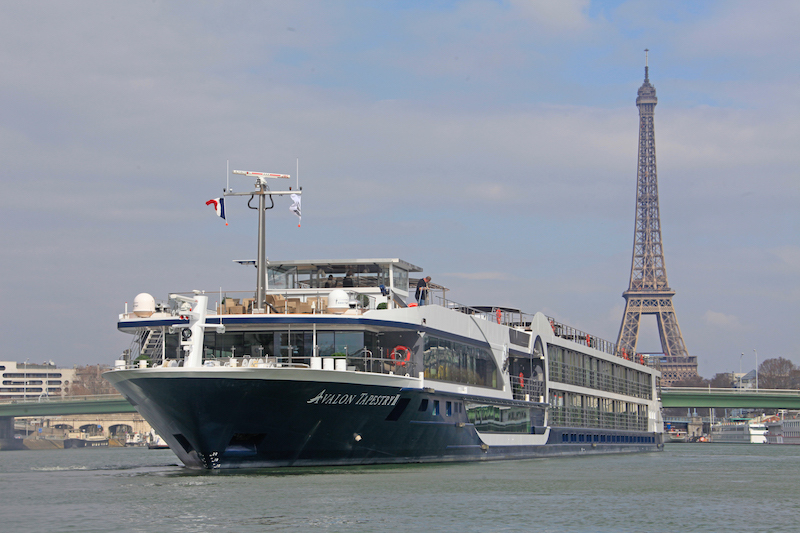 Every day on the Tapestry II brings a choice of destinations, all of them quintessentially French. At Vernon on the first day, nearly everybody goes to Giverny to visit Claude Monet’s famous garden, immediately recognisable from his many paintings of the lily ponds. In June, the roses are in full bloom. There are hollyhocks, poppies, foxgloves, cascades of wisteria over the pergola on the Japanese bridge over the ponds, and the lilies themselves are about to break from the bud. Viewed from the upstairs window of Monet’s bedroom, it’s an inspiring sight, and understandable that he considered the garden his greatest masterpiece. “Colour followed him to the end,” local guide Marie-Hélène declares, telling us how his body lay in state in the bedroom, draped not in black — which he never used — but in patterned curtains from the house, pulled down by his friend and French prime minister Georges Clemenceau. 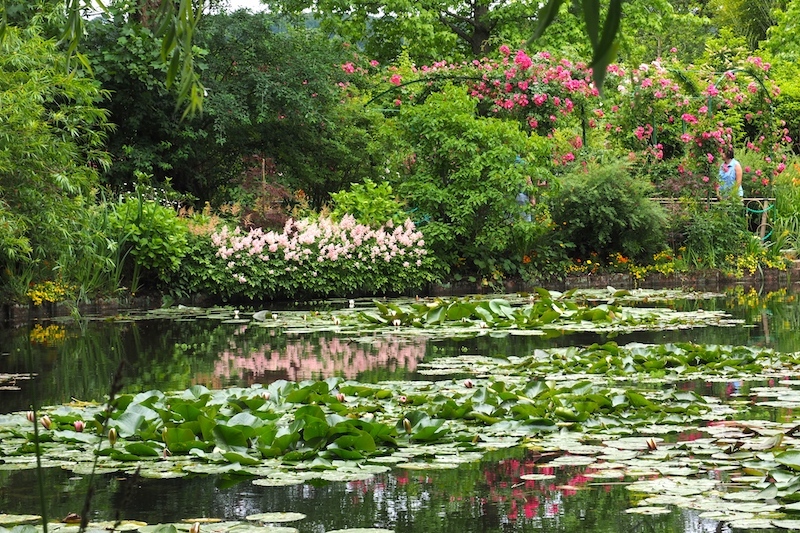 Monet’s garden: It’s easy to see why Monet was so inspired by the water lilies of his gardens (photo: Pamela Wade). Arc, Napoleon, and D-Day — all of which brought both glory and misery to the land. It’s at the landing beaches, of course, where the shadows of the past fall most darkly over the green and peaceful Normandy countryside, its little towns each with a memorial cross and stories to tell. Coaches take Tapestry II passengers to Omaha Beach and the cliff of Pointe du Hoc above it where the sides of the bomb craters are velvety with grass but the bottoms are shockingly deep. 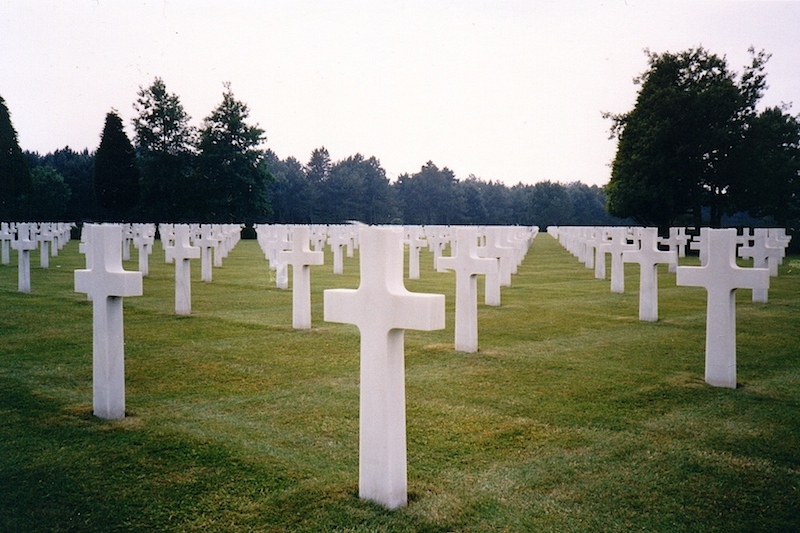 At the US cemetery, the straight lines of the headstones bring order to what then was chaos. American Military Cemetery: An intense memorial to the lives sacrificed on the beaches of Normandy (photo: Pamela Wade). It’s an emotional experience, and some choose the lighter option by spending the day getting a taste of the region instead - some of it literally. In Bayeux with all 70 metres of its famous tapestry, there are water mills on the little river running through the town. At Beuvron-en-Auge which must be Normandy’s prettiest village full of half-timbered houses, Madame serves delicious homemade pâté and quiche, three local cheeses (Camembert, Livarot and Pont l’Évêque) and a six-hour rice pudding, all washed down with cider. There’s more to drink at a family-firm distillery: sweet cider, sherry-like pommeau, and scarily strong Calvados, all of them beginning life as innocuous apple juice. Other stops include Rouen with its medieval cathedral, Joan of Arc monument and enticing cobbled streets; Honfleur which surely has the most picturesque harbour in France; and quaint Auvers-sur-Oise, the town where Van Gogh lived and died. At the Chateau of Malmaison where Napoleon’s Josephine ruled the roost, huge portraits of the couple look down on visitors admiring the clocks, huge jewellery box and carved swans on the chairs as the guide tells tales about this “nineteenth-century cougar” and her orangutan, which wore a dress to afternoon tea. Unmissable Versailles takes opulence and ornamentation to the ultimate level, and the Hall of Mirrors is its greatest glory (although the grandness of the gardens takes some beating). Finally, there’s Paris, the City of Light, with all its treasures large and small, which are - just about - compensation for having to quit what is by now the deliciously familiar comforts of the Tapestry II. Even so, no-one leaves an Avalon ship without planning to return. Tapestry II Paris: Wind your way through the heart one of the world’s great capitals (Photo: Pamela Wade).